Don't give up those dreams of making it to the big stage one day. You have the talent and the attitude of a rock star, now all you need is the hairstyle and you'll be ready to go. Luckily for you, there is no need to wait on your own hair growing out because we have this awesome Hollywood Rocker Wig readily available for you. Now you can have the long luscious red hair metalheads crave. You'll look ready to film the most rockin' music video of the decade. Make sure to have the wind and fog machine ready to go so these red locks appear to be majestically flying by the sides of your face. 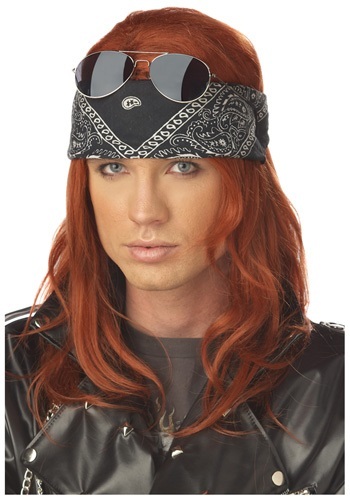 Whether you happen to be the lead singer or just the bassist, this wig will make you the face of the band. All the girls will want you and the guys will want to be you. So get ready for some serious head banging this Halloween!